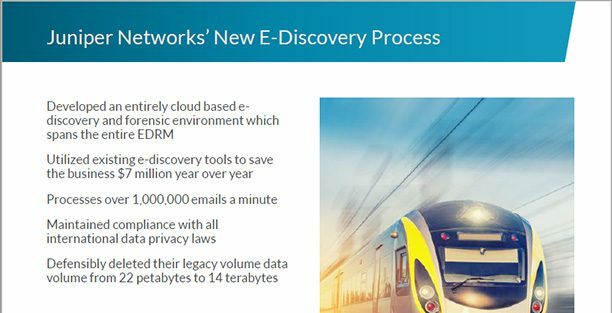 View this on-demand webcast to learn how Juniper Networks created a defensible, streamlined e-discovery process from scratch. In Exterro's new client spotlight webcast series, Exterro clients will discuss how they set up their own e-discovery process and supply attendees with lessons learned along the way. In this on-demand webcast, we will explore how Juniper Networks, a multinational corporation and leading provider of networking products, created a defensible, streamlined e-discovery process from scratch that serves the entire organization.